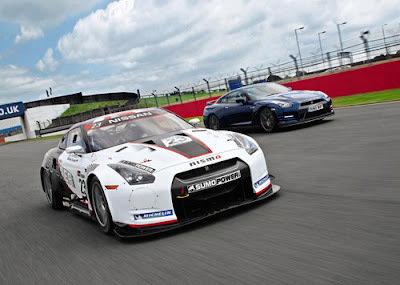 Steve Sutcliffe from Racer Magazine had a great opportunity to take both a normal 2011 UK (2012 US) Nissan GT-R and the full blown Sumo Power FIA GT1 GT-R around Silverstone circuit in the UK. The GT1 car is a purpose built race car, rear wheel drive, V8 powered, and on slicks, but they are restricted in horsepower. A prod on the starter button unleashes big surprise number one. The sound is unmistakably that of a V8, in this case a 600hp 5.5-liter V8, which couldn't be more different in character from the road car's smooth, 479hp twin-turbo V6 (ABOVE). Surprise number two comes when you discover that this car is rear-wheel drive, not four-wheel drive, and that it weighs just 2,755lbs. That means it develops 480hp per ton, versus 301hp per ton for the road car. Oh yes, and it has carbon-ceramic brakes, an electronic sequential 6-speed gearbox (push away to shift down, pull back to shift up, don't worry about the clutch once you get going), plus a set of very slick, very cold Michelin race tires. Head over to Racer Magazine for the full article and pictures. I will have a chance to have a lot more pictures of the GT1 cars starting tomorrow.